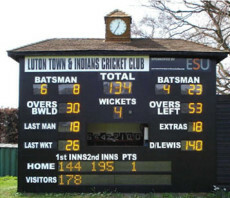 ESU specialise in electronic cricket scoreboards and in particular the refurbishment and conversion of existing scoreboxes and have installations in locations from village greens to county grounds. We also have a range of boxed scoreboards which come as complete units, together with repeater boards which can be run in tandem with the main scoreboard. Prices have come down, in real terms, and many junior clubs find that for a modest budget they can now afford to fit an electronic scoreboard in place of traditionally cheaper solutions.